There's no Bundle Fest without a lootbox bundle, isn't it? [Buy 1 - 5] I feel so lucky today. Yes this it it! This is the day when I'll get my top WLed games from a Fanatical random drop... or not? [Buy 6 - 10] I'll probably get 10 copies of Bad Rats, but "it's worth the money"! Pls send help. [Have] I'm sitting here, couting the probability for me to get a game that I don't own. Right now, it's a bit too low. [Skip] To everyone who voted on the [Buy] option: thank you for your sacrifice, you will be remembered! [Dissapointed] I should have listened to you guys when you said it's not worth it. [Happy] Haters gonna hate but I for one, am very happy with my purchase. All hail Lord Lootbox! I'm glad gambling isn't my vice. Getting sick of these mystery bundles. The quality of their regular bundles are dropping as a result. Yeah... this mystery crap is obviously pretty profitable for Fanatical. People love their lootboxes. Thank you for the input, the games seem decent for 5 euros! It really depends on what you are aiming at. If you want to score bigger and more pricey titles, you would be better off if you bought the 13€ bundle, and if you are ok with the cheaper and more generic mix of titles (and not owning too many of them already), then go ahead with this new batch. Judging from the lower price and the fact that the description only mentions indie games, I'm assuming this is just the regular mystery bundle but without the most valuable games. Bottom 3 are new from the previous dollar mystery bundle. Why not fanatical go open casino? Since there is a hit in the past, karma should have disappeared by this. I made many mistakes buying Fanatical's mystery bundles, so I'll most likely won't get gamble with this. If I do, I'll stick with trying once for the 2 or 3 keys set. Their previous Mystery bundle from last earlier this month (?) or in February promised Dead Cells... silly me. Ended up wasting a stupid amount of money for trying for it, but hey, I know I chose to do that. I like you Fanatical! 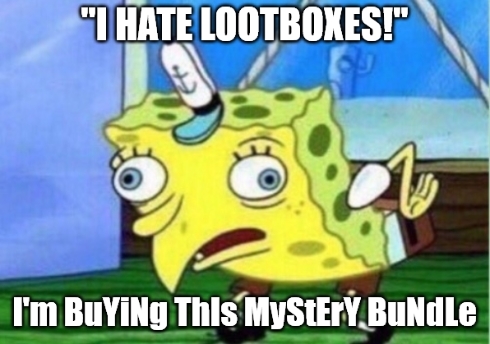 But these mystery bundles are meh (sometimes). It'll be interesting to see what you folks get. They get worse and worse. I could have the option to pick from all the games listed so far and it's still not worth it. Hmm... So is this the way to sploit myself back to level 8? I have most of the games being dropped, and am not interested in the rest other than Galaxy Squad, so I think I'll pass on this. EDIT: GMG's 5 games for $4 and earlier 5 for $1 were just as good or better values, and you could even pick your games! As much as I'd want Hive Jump and Jydge, the odds seem too low compared to getting a dupe. if not jus hitting various GAs; though i guess this is what I "get" for being active in the bundle scene. Lmao. I feel this on a spiritual level. While I agree with the sentiment, a alot of people are just weak to gambling and know it (addictive personality), and they hate being taken advantage of. The only consistent way of winning when gambling's involved, is by owning the joint that's hosting this activity. And 90% of the time they still have some kind of organized crime on top of them so not even.